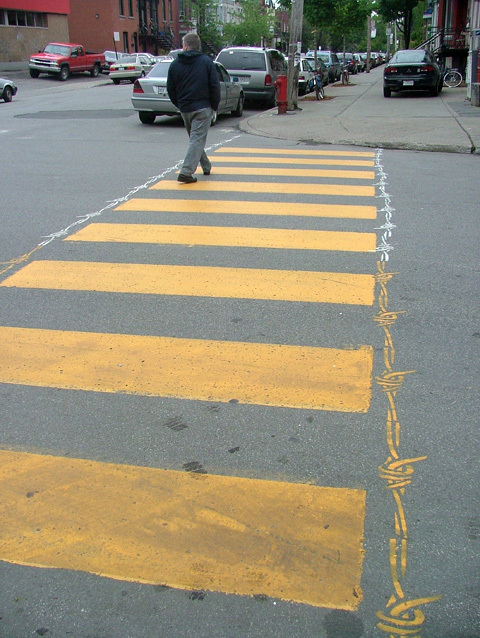 Eight years ago, I was crossing Fairmount Avenue near my apartment in Montreal’s Mile End district when I noticed a strange addition to the zebra crossing beneath my feet: barbed wire. Not actual barbed wire, but a painted rendition of it along the edge of the crosswalk, half in yellow, the other half white, both colours indistinguishable from the other road markings on the street. Strange, I thought. 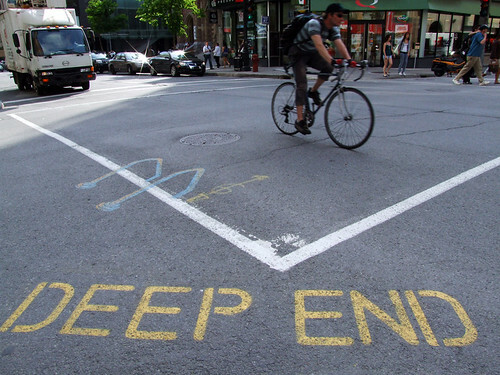 Is this a new initiative by the city to raise awareness of pedestrian rights? A nod to the sanctity of the crosswalk? Before I could finish crossing the street, a car sailed past me without bothering to stop. 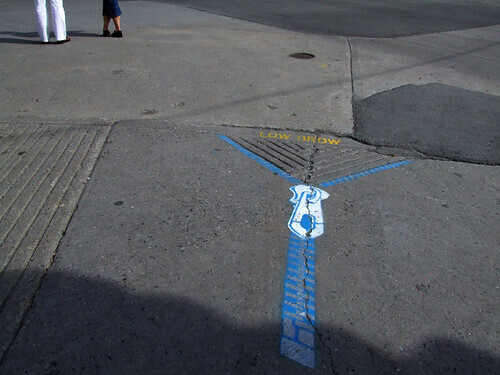 By the time summer arrived, everyone had noticed the funny new road markings around town. Lane dividers were turned into giant zippers. Crosswalk zebra stripes became birthday candles. One crossing had become a giant shoeprint. Many of the works made brilliant use of nighttime shadows: owls stranded in the middle of asphalt during the day found a perch after dark. It was unlike any graffiti I had seen before. I wondered who had done it. My answer came in July, when I visited Wooster Collective, a street art blog. There, I found images of the road stencils I had been walking past for month, and attached to them was a name: Roadsworth. They were accompanied by a brief Q&A. How would you describe your art to someone who could not see it? What would happen if the guys who are hired by the city to paint the lines on the street decided to drop acid while on the job. What is your greatest ambition? To turn Montreal into a car free zone. By now, every culturally-attuned Montreal is familiar with Roadsworth’s story. After a surge of popularity in 2004, he was arrested and subjected to some spectacular criminal charges. In the media uproar that ensued, we all learned Roadsworth’s true identity: Peter Gibson, mild-mannered musician by day, graffiti-writing deviant by night. The publicity helped Gibson establish himself as a full-time artist. But for all the buzz generated by his early graffiti, there has been surprisingly little mainstream discussion about the questions raised by Roadsworth’s street art. After graduation, Gibson began playing jazz, funk and dub-influenced music with “a lot of bands you’ve probably never heard of” — Ark of Infinity, Whip Cream, Kalmunity — as well as piano for the Union United Church Gospel Choir. After a few years, though, Gibson felt he had run into a dead end. “I wasn’t creatively satisfied,” he recalls. When his girlfriend introduced him to the work of Andy Goldsworthy, a British artist who creates site-specific installations from natural materials, he was compelled to do something similar. At the same time, Gibson liked the repetitive patterns employed in Goldsworthy’s work, and he found a similar aesthetic in the painted lines that governed behaviour on the street. He adopted a pseudonym that paid homage to Goldsworthy and the writer William Wordsworth, and created a range of stencils that he could use to satirize the city’s road markings. His first efforts were crude — he was using road paint from a gallon bucket — but he quickly honed his technique. “I wanted to create something subliminal, something that looked like it belonged there,” he says. Kohl says he was “excited and confused” when he first saw a Roadsworth stencil. “Like a lot of people I wasn’t sure whether the city had done this, or it was the work of a local artist. The fact that I was questioning this at all was something new for me,” he says. When he found out that Roadsworth was Gibson — his bandmate in Ark of Infinity — he made him the subject of a feature-length documentary, Roadsworth: Crossing the Line, which was released by the National Film Board in 2008. In his landmark 1988 essay Kool Killer, French philosopher Jean Baudrillard argued that graffiti was a revolt against the systems of social control that characterize the post-industrial city. Roadsworth took that to a new level by literally subverting the rules of the road. This wasn’t something that Montreal authorities took kindly to. Gibson says he laid down more than 300 stencils between 2001 and 2004, a time when the City of Montreal had spent $4.5 million to remove graffiti and step up enforcement against it. He was always aware of getting caught, so he worked furtively, sometimes taking an entire night to complete a single intervention, pausing to hide when he saw what might be a police car. Sometimes Gibson was helped by his girlfriend (now wife), Nikoo Asadi, whom he met in 2001. “On a couple of occasions when we were laying down a stencil and a cop car would approach, we would start smooching as a decoy — a way of saying, ‘Nothing to see here.’ Of course it was also a great excuse for a smooch,” he says. The smooch strategy didn’t always work. The first time Gibson was caught by police, he was arrested but not charged. Later, he was caught again and ordered to pay a small fine. “Strangely, it actually encouraged me to continue doing what I was doing, because it seemed at the time that the police were unaware of my other activities and the extent to which I had already bombed the city,” he says. Gibson fell into a depression. “I felt like my life was over,” he says. But news of his arrest spread quickly, and within a few weeks a vocal campaign, spearheaded by Chris Hand, was calling for the charges to be dropped. Alt-weeklies like the Montreal Mirror ran glowing profiles of Gibson while the intellectual newspaper Le Devoir took an interest in his case. La Presse urban issues columnist François Cardinal penned a strongly-worded editorial in Gibson’s defence, which helped galvanize mainstream public support. He had reason to be optimistic. Two years after his arrest, thanks to sympathetic media coverage and public support, Gibson’s charges were reduced to five counts of mischief. He was ordered to pay a $250 fine and serve 40 hours of community service, which he spent by painting a whimsical scene of alligators, dragonflies and vines on the asphalt schoolyard of a Mile End elementary school. Since then, Gibson’s work has shifted to commissions, usually from public institutions. He works almost as often abroad as he does in Canada. But his work is still rigorously site-specific, and it still raises questions about the social and ecological consequences of the way our cities are run. Last summer, Gibson and his friend Brian Armstrong transformed the glass-and-steel atrium of Montreal’s Eaton Centre shopping mall into an artificial ecosystem made from waste generated by the mall’s tenants. The installation, “Fragile,” was unlike anything Gibson had ever done. It was textural, three-dimensional and enormous in scale. When I visited on a sunny day in July, it seemed to have attracted a lot of attention from shoppers, who stopped to take photos and videos of giant cardboard trees and an upside-down plastic-bottle fish pond. Chris Hand wasn’t impressed. On his blog, he dismissed the installation as corporate greenwashing and criticized the quality of its execution. “I’m fairly certain that there are some people out there who can use ‘craft’ materials and make some pretty awesome stuff. Peter, right now, isn’t one of them,” he says. Art criticism isn’t the only thing missing from the discussion about street art. For all the attention given to Rob Ford power-washing graffiti from downtown Toronto alleys, and all the suggestions that graffiti can be dealt with by providing sanctioned venues for street art, nobody has bothered to address the uncomfortable truth about the medium: that it’s most meaningful when it is illegal. Roadsworth’s work has become more sophisticated since his arrest, but it is often less impactful than when it was found by chance on a Mile End streetcorner. “The fact that it’s illegal and therefore uncensored allows artists to push boundaries, provide a counterbalance to commercial imagery, and essentially question the role of art and artists in contemporary societies,” says Anna Waclawek. Unlike an urban highway or a misguided road widening, street art doesn’t take long to disappear. Last year, I wandered around my old Montreal haunts, trying to see if I could spot any Roadsworth graffiti that has survived six years of winter road salt. I didn’t find anything. But I did find something similar to his first bicycle stencil along the miles of new bike paths that have opened in the past few years. It would be outrageous to credit Gibson for Montreal’s embrace of the bicycle, but it certainly reflects a change in mindset that his graffiti helped bring about. Roadsworth challenged the order of things — and in some small way, the order gave way. See more photos of Roadsworth’s work on his website. This story was originally published in the Winter 2012 edition of Spacing magazine. This entry was written by Christopher DeWolf , posted on Wednesday April 04 2012at 01:04 am , filed under Art and Design, Canada, Environment, Interior Space, Politics, Public Space, Society and Culture, Transportation and tagged Art Installation, Graffiti, Mile End, Montreal, Plateau Mont-Royal, Public Art, Roadsworth, Street Art . Bookmark the permalink . Post a comment below or leave a trackback: Trackback URL.